Few events in world history have had a more profound impact than that of World War One (1914-8). Although the German attempt to dominate Europe was thwarted in the end, the equilibrium of the region was also destroyed by the fierce fighting between its different elements. The Middle East was no less affected by the conflict. After four centuries of continuous rule, the Ottoman Empire collapsed, creating a vacuum that contributed to tensions between local inhabitants and external powers or interests. The 'war to end all war' had not achieved its aim. 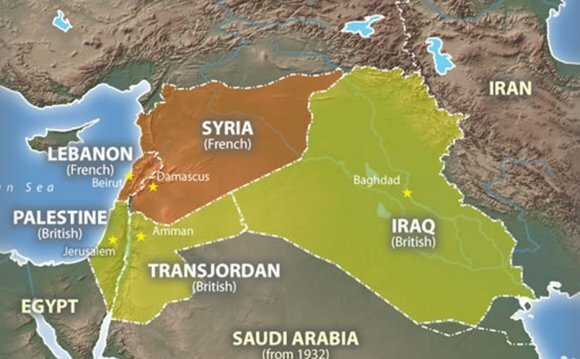 At the beginning of November 1914, the Ottoman Empire, the world's greatest independent Islamic power, abandoned its ambivalent neutrality towards the warring parties, and became a belligerent in the conflict, with the sultan declaring a military jihad (holy war) against France, Russia and Great Britain. The Ottoman Empire had recently been humiliated by setbacks in Libya and the Balkans. Participation in what had begun as a European war might seem to outside observers, therefore, to have been suicidal, but key elements in the government, impressed by German industrial and military power and motivated by dreams of imperial glory, greeted the expanding war as an opportunity to regain lost territories and incorporate new lands and nationalities into the empire. The Ottoman/Turkish army (some 600, 000 troops divided into 38 divisions) was of an unknown quality. But with Germany as an ally, the Ottoman Empire represented a serious threat to the British Empire, so in a pre-emptive strike, London immediately landed an Anglo-Indian force at Basra, near the estuary of the Euphrates and Tigris rivers. This was done to protect the Anglo-Persian oil pipeline, which was vital to the British navy, and to show the Union Jack in this strategically important area in the Persian Gulf. Within weeks the Central Powers struck back with a surprise attack against Britain's 'jugular vein', the Suez Canal. This attempt, in early February 1915, to breach British defences on the Suez Canal and raise an Islamic revolt in Egypt, failed however, and resulted in heavy losses for the attackers. Unwilling to commit all of its emerging military resources in 1915 to the Western Front, where trench warfare prevailed, the British leadership embraced a naval offensive against Istanbul to force the Ottoman Empire out of the war. When the Royal Navy in February and March was unable to fight its way through the Dardanelles to place the Ottoman capital under its big guns, the military authorities hastily assembled an expeditionary force to land on the Gallipoli peninsula. The muddled thinking that led to this campaign continued during the savage fighting, and the predominantly British force suffered heavy losses (205, 000 British soldiers, and 47, 000 French - with the sick included in the figures) and had to be withdrawn. The Ottoman/Turkish Fifth Army, well armed and fighting from strong defensive positions, had proved more than a match for the Allies. Political objectives, as had been the case in the Dardanelles/Gallipoli venture, had trumped military considerations - the Anglo-Indian force did not have the necessary reserves or logistical support to retain Baghdad, even if they had been able to capture it. Moreover, a strong British presence in Mesopotamia had no connection to the defeat of Britain's primary strategic rival, Germany. But the Indian government were concerned that a holy war might be ignited in Persia and Afghanistan, thus threatening India, and they wanted British prestige upheld in the Islamic world to avert such a war. A more difficult theatre in which to fight would be hard to imagine. Flies and mosquitoes attacked the troops, many of whom became sick. Soldiers froze during the winter nights, and were overcome by heat during the summer. Dust turned to mud when the banks of the Tigris overflowed during the rainy season. Murray's failure to capture Gaza led to his replacement by General Sir Edmund Allenby, a soldier of great vigour and imagination, who was able to create a personal bond with his troops. His government hoped to achieve a concrete victory to boost morale at home, and gave him the flexibility to advance on Jerusalem. In October, when the weather was more favourable, Allenby made good use of his infantry and a large mounted force, which included many troopers from Australia and New Zealand, to break through the Gaza-Beersheba Front. And after a difficult advance across the Judean hills, he walked through the Jaffa Gate on 11 December 1917 as the 34th conqueror of Jerusalem, the first Christian conqueror since the Crusades. Many of Allenby's soldiers were deeply conscious that they were fighting on sacred soil, and some viewed themselves as modern-day crusaders, but their leader was acutely aware that many of his soldiers and workers were Islamic, and he vigorously played down any notion of a crusade. Convinced that neither side had the means to achieve victory in France in 1918, Prime Minister David Lloyd George sought to make Allenby's theatre the focus of his country's military effort. Germany's massive offensives closer to home during the first half of 1918, however, forced the government to recall most of Allenby's British soldiers to France. Allenby, who retained his cavalry, received replacements for his infantry in Egypt from many sources, predominately from India but also from many other diverse nations ranging from Burma to the West Indies. Allenby returned to the offensive at the Battle of Megiddo, on 19 September 1918. With a decided advantage in manpower, artillery, air power and morale, and assisted by Arab allies on his flank, he quickly destroyed the Ottoman/Turkish armies facing him. Once the enemy front was broken, the EEF's cavalry dominated the campaign. Damascus fell on 1 October, Aleppo, the last city to fall in the campaign, on 26 October. Five days later an armistice with the Ottoman Empire came into effect. Since 19 September Allenby's forces had advanced hundreds of miles and netted over 75, 000 prisoners. The Balkans Campaign was the invasion of Greece and Yugoslavia by the Axis powers during World War II. It began with Italy's failed invasion of Greece on 28 October 1940 and ended with the capture of Crete by German and Italian forces on 1 June 1941. The 20th century is defined as the time period running from January 1, 1901 to December 31, 2000.